Fishing the Irwell - An Urban Fly Fishing Journey: End of the trout season - Where has the love gone? End of the trout season - Where has the love gone? With the trout season officially over yesterday many of those who have followed me may have wondered where that last day opportunity to catch 'Big Barry' was or even where i have been the past 3 or 4 weeks. At the moment i am probably at a low point in my fishing 'career', the season starting off so well, but the year flew by and come the end of the season bad things where coming thick and fast. One blog i couldn't bring myself to write really was the one where i failed in saving the drowning dog, another day i went fishing after a particularly rough and abusive day at work the headache behind my eye was so excruciating i just sat and watched the river for an hour before heading back home. That alongside the pollution incidents, one happening on a River i had fished also hit pretty hard. It sort of felt like i was a curse, everything i had touched was being effected in a negative way. As much as i had become this lover of solitude and the hidden wilderness on our doorstep the more time i spent in it the more i was seeing bad things happening on it, yes i saved the duck but with the dog happening a week after it was hitting home of how much actually happens on our rivers, i am one man on a huge river and within a week i witnessed 2 animals drowning. What else don't we see? 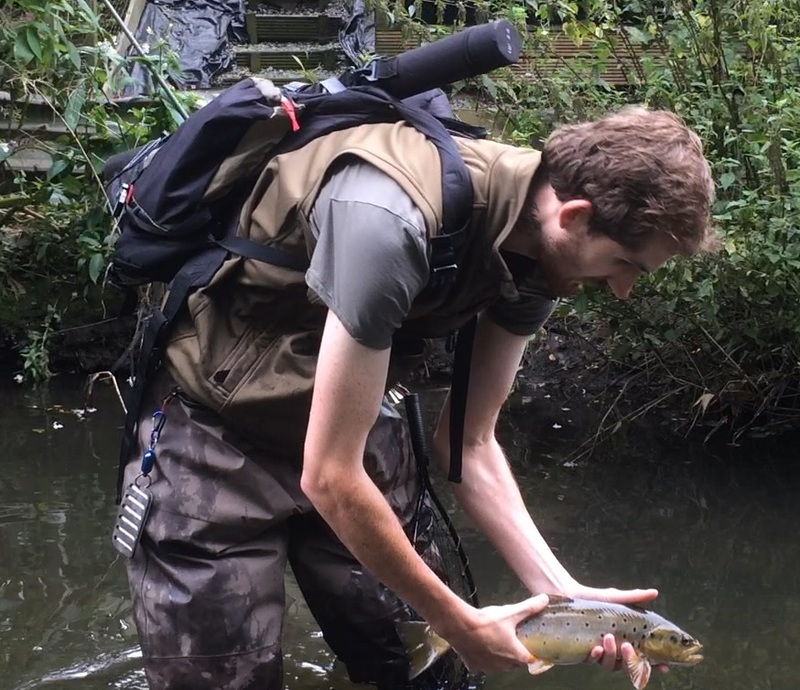 As much as i like to keep sections of river i fish secret especially small streams, the River Douglas pollution really pissed me off, i had fished it once and caught my PB chub there and some good trout, but it is the lack of action, the lack of urgency and the lack of care that i feel really hits me. It's not just the fish it's the whole ecosystem the river provides, what will happen when people find dead deer poisoned by the polluted water littering the land? Hell, it might take someone to drink the water purposely during a pollution incident for any action to take place. Manslaughter anyone? But despite all this there is the fishing side, Now i caught more trout (241 compared to 220) than last season in around half the trips, and course fish were almost none existent as i didn't fly fish the canal this year but the true fact is, especially after JT's guidance i became a more prolific fisherman, i was landing easily 80% of the fish that took the fly, before that especially last season it was easily around 25%. I would miss takes and lose fish in the fight all day and could easily have double figures almost every trip i went out on. Now if you do the math that works out that i could of had around 1000 trout last season, thats just under 20 a trip as i went out just over 50 times last season. This season i would of probably only had about 300 had i landed them all, now admittingly, i wasn't fishing for as long, having moved further away i was walking alot further to get their reducing my actual fishing time but it still felt on some days the fish just weren't there. The fish counts at the beginning of the season were alot higher than at the end and as we came to the end i expected alot more but no. I would fish runs i knew there was fish, change flies, colours, weights, depth nothing. But still something is afoot. A positive of note however was my fly tying, i hadn't intended on selling flies but after a few messages via instagram i decided to pop a couple on ebay and other than the UK i have shipped flies to Argentina, Italy and Australia! I only hope they don't hit the same rut i have at this time of the year. When your fishing becomes self sustainable for cost it very much keeps the mrs happy. If you made it this far, then i hoped you enjoyed the blog and the pictures. Thanks for the blog - really enjoyed it. Don't get too down, as an angler you know that nature is never 'cosy' or comfortable - it just IS. Things even out. And look at those wonderful fish! From the NW too. I would be over the moon to catch just a small number of those, and when I was young pollution was far far worse. But I think you know at heart , true fishing is never just about numbers - its far more complicatecd than that. But well done, and thanks. yeah it's isn't the number of fish i catch as a 'i caught 20 today' point of view it's more of a ecological view. ie why is there less, has there been pollution as EA have confirmed when they say 'all things back to normal now' after a huge fish loss. pollution can be over with in a matter of hours without anyone noticing, only has to kill the food sources to have a knock on effect, have their habitats been ruined as alot of areas are now purely bed rock from the floods which means no nymphs can live there as they have no gravel to cling to nor is it good for spawning, now it should even itself out elsewhere but with man made walls and that from the old era and new constructions the river can no longer cut it's way new ground via erosion as it meanders around so new gravel and debris cannot enter the river to provide suitable habitat for nymphs to live. But yeah i am lucky i am in a time where there are actually fish living in it, but i only hope now it is sustaining fish it isnt ignored until another pollution event happens. Isn't it fascinating, the incredible variation in spot patterns, spot shapes and colours that can be seen in fish from the same river. I see it where I fish too, and find it quite astonishing. yeah it's why it doesn't get boring, even a small fish can be a beautiful fish to look at, i used to love perch and pike as a kid as i loved their slight variations but with trout they are so varied. it's what them extra chromosomes do to you! Good read this mate and a few nice brownies there. Only started fishing this year and im absoluty hooked. Next season im gonna try and fish the fly but for now i have a few more species to cross off my list and a couple of adventures in mind in the hope of a few worthwhile write ups.